If you're looking to buy a truly stylish-looking guitar, packed full of vintage tones and modern electronics, then you've come to the right .. If you're looking to buy a truly stylish-looking guitar, packed full of vintage tones and modern electronics, then you've come to the right place. Introducing the Gretsch G5420TG Electromatic Hollow Body Ltd Edition White - a gorgeous, versatile semi-acoustic guitar, with all gold hardware. With the Gretsch G5420TG Electromatic Hollow Body Ltd Edition White you get a stunning, affordable take on the legendary White Falcon - a professional-grade, stylish hollow-bodied guitar, renowned for its White and Gold visage, and incredible voice. With it's high-quality 5-ply maple body, and a set of powerful Filter'Tron Blacktop humbuckers, this guitar delivers the kind of electrifying authenticity that cemented Gretsch guitars as true rock and roll legends. Designed to fully compliment the G5420TG's hollow-body design, these powerful humbuckers deliver a vintage voice that explodes with huge punch and clear, strong presence. The Blacktop voice is one that's become synonymous with Gretsch over the decades, and sound just as good clean as with a distorted signal. In addition to that, these pickups are controlled via the standard Gretsch control system of a Master Tone, individual Volume pots, and an overall Master Volume control with treble bleed circuit, giving you access to a versatile array of tones. 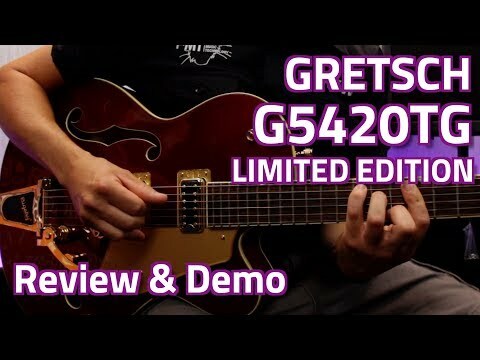 Gretsch Electromatic guitars are designed to offer players the opportunity to own a guitar packed full of vintage Gretsch sensibility and tone, but at an incredibly reasonable price. However, despite being more affordable than a Professional Series Gretsch, these guitars are still professional-grade, offering you superb value for money. As stated above, this guitar is Limited Edition, and available only whilst stocks, so we recommend you make your purchase sooner rather than later to avoid missing out. If you'd like to query the availability of this guitar, then don't hesitate to contact our Online Sales team or your Local PMT Store.